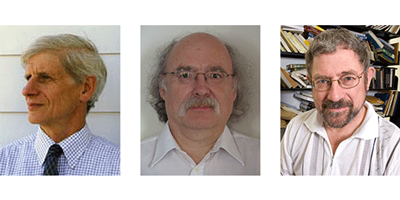 Prize recognizes David Thouless, Duncan Haldane and Michael Kosterlitz for developing the theory underlying many exotic states of matter. David J. Thouless, F. Duncan M. Haldane, and J. Michael Kosterlitz won this year’s Nobel Prize in Physics for their theoretical discoveries using topological concepts. Their work pioneered a new understanding of phase transitions of matter, paving the way for current and future work with topological insulators, superconducting materials, and other applications in condensed matter physics. Read more in the Focus story “Nobel Prize–Topological Phases of Matter”. Additional information can be found in this update from APS News.